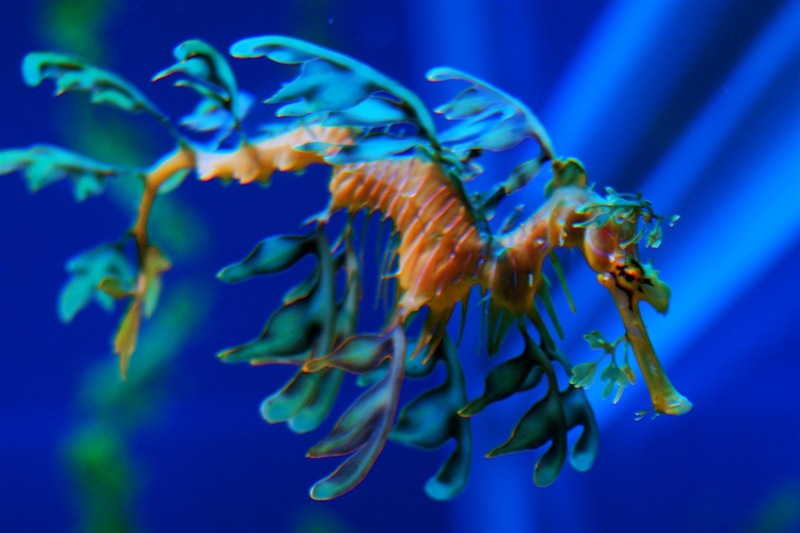 Found in the warm southern waters of Australia, the Sea Dragon surely must be considered the most beautiful of Earth's weird and wonderful animals. By far the most ornately camouflaged members of the animal kingdom, they blend seamlessly into the seaweed and corals that dominate their habitat. Closely related to seashorses, it is the male sea dragon that carries the young, holding them in a spongy brood patch on the underside of the tail where females deposit their bright-pink eggs during mating. The eggs are fertilized during the transfer from the female to the male. The males incubate the eggs and carry them to term, releasing miniature sea dragons into the water four to six weeks later. There are two species of sea dragon (which belong to the Syngnathidae family by the eay) , the leafy sea dragon (Phycodurus eques) and weedy (Phyllopteryx taeniolatus). Leafies are generally brown to yellow in body colour with olive-tinted appendages. Weedies have less flamboyant projections but more colourful, typically red colour with yellow spots. Below is an extract from BBC's Life series and looks at the unusual mating habits of the leafy sea dragon!